Sabrina has been a performer since she was a child. Always fond of the spotlight, she began performing at the age of 5 in ballet competitions and recitals. She has since gone on to compete in many dance competitions and perform in ballet, jazz, French folk dance, and, as an adult, ballroom, Latin, swing & country dance. Some performances were as a solo artist, others with a partner, and many were group or formation numbers. In studio showcases, she was also part of the acting as well as the dancing. Sabrina was also active in drama & voice in both school and public productions and attended the Musical Theater Program at Grant MacEwan College. 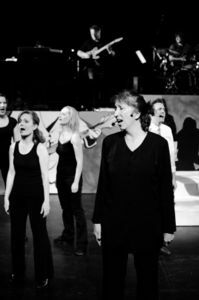 Her love of singing, dancing and performing brought her back to the world of musical theater in 2010 to perform with Edmonton Musical Theater in “Ladies in Lights”. She has since returned as a guest dance instructor for their adult workshop program. For EMT’s 2011 show, “Broadway Rocks 2”, she wore three hats - Assistant Choreographer, Dance Captain, and performer! Also, for 3 years she was a performer in the Annual Johann Strauss Ball. She is always thankful for the opportunity to share herself with an audience or a class!